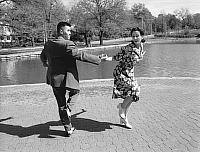 Frankie Hoang and Jeanne Denny - during a "Swing Bomb" at Loose Park in Kansas City, Missouri, spring 1999. Frankie and Jeanne started "Cat's Corner" to teach and promote Lindy Hop in Kansas City. Both of them moved elsewhere and Cat's Corner was continued by others. Eventually Cat's Corner folded into the KC Lindy Hop Society. 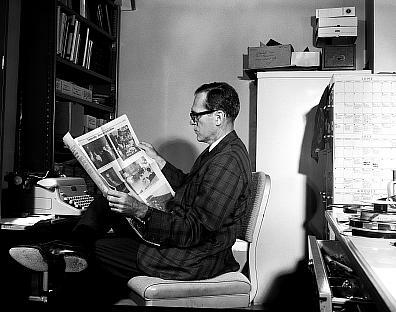 Frank O'Neil, my photography teacher, summer 1967 at the University of Nebraska Journalism School. We learned on Speed Graphics and Crown Graphics with 4x5 film. This was scanned from one of my early 4x5 negatives. I worked as a photo lab assistant the following two semesters at the school. I always loved the darkroom. Swing at the Grand Emporium to the music of "Big Six" from London, England. Carolyn, Tex (with fan) and Big Six Sax guy. 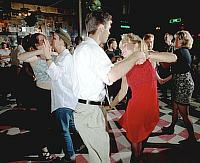 1999 - This was in the wanning years of a swing revival in KC's nightclubs, starting at the Hurricane and moving to the Grand Emporium. Swing at the Grand Emporium - Janette and Chris and Bruce and Shawna and Lynne - regulars among the swing crowd. West Coast Swing, Matt Auclair and Ellen Ransom, in the background judges Debbie Figueroa and Jeanne DeGeyter - points competition - Grand Prix of Swing, July 2005, Kansas City, MO. West Coast Swing - Crystal Lambert and Matt Auclair - points competition - Grand Prix of Swing, July 2005, Kansas City, MO. 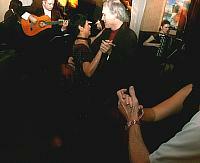 Tango: Jenny and Bruno at Fedora's - 4/13/2000 - during the early part of Argentine Tango at Fedora's 210 (now gone, replaced by George Brett). 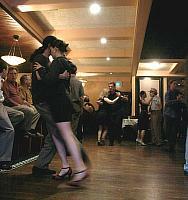 Liz O'Keefe introduced Tango to Fedora's and this was a regular Wednesday night feature for several years. Kansas City Kansas Blues Festival - 25 June 2005 - This is one of the true-grit music festivals in the Kansas City area. The dancing is on the road in front of the stage (here the stage is to the right). In this shot a procession is moving from the stage to the left and through the crowd which is one the lawns, hillside and way, way down the street. Swing dance instruction - Knuckleheads Saloon - 29 June 2005 - Ben Pruett is the regular instructor at the saloon, located under a highway bridge and next to railroad tracks. A true blue-collar bar you can almost step back to the 1950's here. Ben was a prominent swing dancer in the KC swing scene in the later 1990's and he is still moving to rock-a-billy at Knuckleheads. Swing - New Floor at Louis and Company - Laura Cantu, Louis Bar and Dave Stephens - This was the first night for the new dance floor at Louis' studio in Overland Park, KS.